The holidays are a time to give and receive. If you are lucky enough to be receiving a nice company bonus this year, let me be the first to congratulate you. Your hard work has paid off. But since you were awarded a bonus, there are a few things you should know with regard to your taxes. First, even though this is bonus money, it is still considered taxable income by the IRS. You will need to pay federal income taxes on this money. If your employer pays you the bonus through their regular payroll system, they should handle the tax withholding as they normally do. But don’t be surprised to see taxes of 25% withheld from this bonus money. Why? IRS guidelines typically require taxes of 25% to be withheld from income that is considered a supplemental wage. Bonus money is usually considered supplemental. Keep in mind that just because 25% is withheld, you might not owe that much on this money. The IRS just requires it upfront via the withholding. You may get a percentage of it back when you file your return next April. If your employer pays you with cash or in some way outside of their normal payroll system (e.g. hefty gift card), this isn’t an invitation to become a tax evader. You should simply report this bonus as income on Line 7 of your Form 1040. With that in mind, make sure you set aside some of the bonus for taxes. If you have money being automatically contributed to a 401(k), health savings account, or other tax-advantaged savings vehicle, then be careful with bonuses. Your employer will likely continue to contribute to these accounts with the bonus payout using the original contribution percentage that you set up. So if you already automatically contribute 5% of your gross income to your 401(k), your employer will probably take 5% of your bonus money and put it in your 401(k). If you are not careful, you could exceed your annual maximum allowable tax-deductible contributions to your 401(k). Most employers should be tracking this information for you, but some may not. Check into it. More Retirement Savings – Use your bonus money for additional retirement plan contributions. You could do this through your 401(k) or 403(b) at work. Just make sure you get the money into your account prior to the end of the year. If you don’t have an employer plan, you could make a traditional IRA contribution. With an IRA you have until the date you file your taxes to make the initial contribution. Green Home Improvements – Does your home need upgrading? Energy-efficient home improvements will provide you with a tax credit of up to $1,500 or 30% of the cost of the improvements. Qualifying improvements include things like adding insulation, replacing windows, and adding energy-efficient doors. 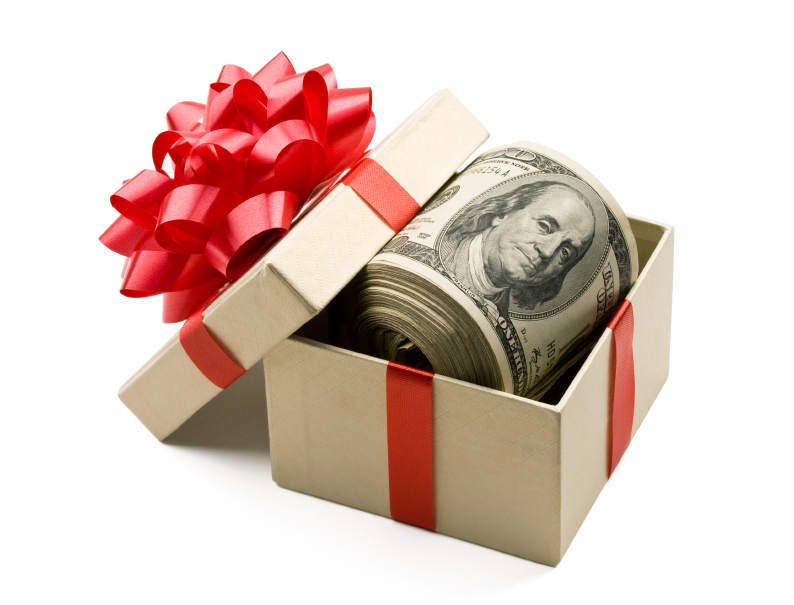 Give it Away – If you were fortunate enough to get a bonus this year, you may desire to share some of that bonus with those people or organizations in need. Giving money to a qualifying charitable organization will provide you with a tax deduction as long as you itemize deductions on your return. Make Pre-Payments – If you have a mortgage, consider making your January mortgage payment in December. This will add to the amount of mortgage interest you paid in the year. Like charitable contributions, mortgage interest is deductible if you itemize. You should also consider making your property tax payments prior to year end, as this will give you another deduction. Congratulations again on your holiday bonus. Have fun spending it wisely! can payroll taxes be spread over say a 12 month period? I understand that bonuses are subject to normal taxes and withholdings, but are they allowed or required to also withhold your retirement contribution from said bonus? And if so, shouldn’t they only be allowed to withhold the mandatory amount and not the amount that I voluntarily have them taking out? I think this is not ethical. In working with senior citizens, it is always taught not to accept money or gifts from them if you work for them. What the company is doing makes it even more unethical, they are taking money from people who already pay them for a service and taxing it as if it was their own income. In short, I believe the company should not have any dealing with that money because the senior citizens are already paying the for a service. If you must take money from them, it should be a gift or a personal check to an individual and not the company. I work in a retirement community. The residents of this community write a personal check to a fund that is distributed equally to all employees. This year the corporation took that fund and taxed it. I understand if my employer gave the bonus it should be taxed. But if people who are not part of the company give the money how can my employer tax it legally like they are giving it? If your employer includes that money as business income, then the disbursement of it to employees is wages. If they residents of the community want to be sure the money is not taxed, they should create their own fund to handle to collection and disbursement of the funds. Is there a way to defer the tax withholding from the bonus (for several months, lets say)? There is a legal requirement on your employer to withhold the taxes at the time the bonus is paid. There in no way to defer the withholding short of deferring the payment of the bonus.